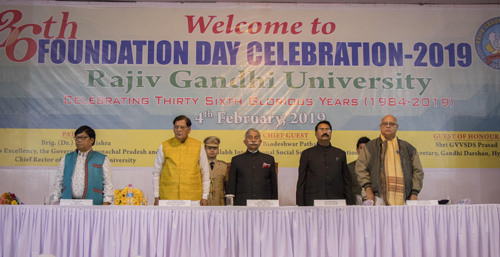 RONO HILLS, Feb 4: Governor BD Mishra called for concerted efforts by all the stakeholders to make Rajiv Gandhi University (RGU) one of the best in the country. “Mahatma Gandhi’s greatest gift to humankind is ‘Satyagraha’ and basic education. The central concept of Gandhi’s ‘Nai Talim’ is building the individual through the three dimensions of human being – the body, the mind and the spirit,” Prasad said. Founder of New Delhi-based Sulabh International Social Service Organization (SISSO), Bindeshwar Pathak, illustrated how SISSO’s social, educational and sanitation works, spanning over five decades, have made a significant contribution to social renewal and nation-building. He said Sulabh International pioneered the production of biogas and bio-fertilizer from excreta-based plants, thereby showing that human waste can be disposed of in an affordable and a socially acceptable manner. He said Sulabh International has constructed a cluster of eight “mega toilet complexes,” comprising 1,417 toilet units, in the vicinity of the temple in Pandharpur, Maharashtra. The longest serving employee of RGU, Nathu Ram Joshi, recounted how the university had begun with barely five staff members and just three departments. He reminisced how the staff had to cross the Dikrong river by boat to reach the campus, and how, in spite of the fear of the many elephants that roamed the campus those days, the employees and students stood their ground and contributed to the university’s growth. Joshi expressed hope that even after his retirement (due in a year’s time), the university would grow and reach newer heights. Registrar (in-charge) Prof Tomo Riba, Joint Registrar (Academic) Dr David Pertin and Hindi Officer Gumpi Nguso also spoke. Other highlights of the foundation day celebration were the employee awards, which were presented after a gap of 15 years, a friendly football match between VC-XI and Registrar-XI, a blind hit and musical chair competition for female employees, and a ‘cultural nite’ programme staged by the RGU community.